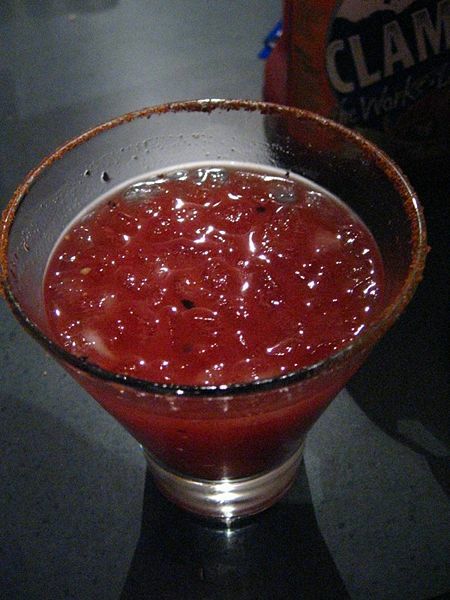 A Caesar, sometimes referred to as a Bloody Caesar, after the similar Bloody Mary, is a cocktail popular mainly in Canada. It typically contains vodka, clamato (a blend of tomato juice and clam broth), Worcestershire sauce and Tabasco sauce, and is served on the rocks in a large, celery salt-rimmed glass, typically garnished with a stalk of celery and wedge of lime. A common nickname for a version without vodka is Virgin Caesar. The drink itself is primarily consumed in Canada. Variations can include substituted or added ingredients, like salt and pepper, wasabi, cayenne pepper, horseradish, or lime juice, seasoning salt or lemon pepper (rather than celery salt), a garnish of dill pickled cucumber, spicy pickled green bean or asparagus. Occasionally a prawn (especially in seafood restaurants) or crisp bacon is used as a garnish. Other names for a Caesar include Bloody Caesar, Canadian Caesar, Salted Caesar, and Clamdigger. Serve in a highball glass, on the rocks; garnished with a stalk of celery and wedge of lime.